Home / Blog / Mineral Power! Mineral makeup is not just a phenomenon promoted by infomercials on Saturday morning television, nor is it a fleeting fad endorsed by fashion magazines. This new form of foundations, blushers, and other beauty products made from minerals is paving the way for healthier, more natural makeup. Mineral makeup has increasingly become the talk of the town in the makeup world over the past 5 years. Firstly, it is important to learn why this new formula of cosmetics is winning over the hearts of women (and some men) all over the world. The minerals themselves, titanium dioxide, zinc oxide and iron oxide mixed with pure pigment offer many skin care benefits. Titanium and zinc are natural anti-inflammatories, so they calm and soothe the skin; titanium dioxide is a natural sunscreen and carries an SPF of 15 to 20; and the minerals won't support bacteria growth like standard makeup, because the minerals are inert. It is also a favorite for mature skin that needs more luminosity. Unlike dull cakey foundations or oily coverup, minerals reflect light, like tiny little mirrors, helping you look your glowing best. Most mineral makeup must be applied with a “Swirl, Tap, Buff” technique. It is a very easy method to learn, from the website of the brand you choose, or from a consultation with an expert. 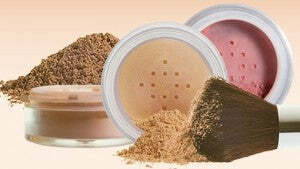 In fact, mineral makeup has been said to be easier to apply than its traditional counterparts. One such brand, Bare Escentuals, is the #1 Mineral makeup in the world, and has been around for 35 years. In Canada, Bare Escentuals can be found in Sephora, Murale and Pharmaprix. It also improves your skin with time, meaning if you tend to get imperfections, you will see that they will start to diminish, and it improves the hydration in your skin. If you are a more hands-on learner, there is a fabulous makeup line called Glo Minerals www.glominerals.com available at Victoria Park www.vicpark.com. The makeup artists at the Victoria Park day spa are always more than willing to teach beginners how to apply mineral makeup using the right techniques. It may sound complicated, but mineral cosmetics are ushering in a new era of flawless, airbrushed complexions without the use of heavy, oily foundation. Once you learn the simple application steps, you will never go back to smearing on liquid foundations and cakey powder. Give the websites a quick glance—like finding a diamond in the rough.